A satellite malfunction left thousands of people across parts of rural northern Canada without communications services and grounded dozens of flights Thursday (Oct. 6), according to Canadian press reports. Officials with the Ottawa-based satellite operator Telesat Canada said the malfunction began at 6:36 a.m. EDT (1036 GMT), when its Anik F2 communications satellite suffered a "technical anomaly." The glitch affected satellite-served communities in the Northwest Territories and Nunavut territory, according to Canadian communications provider Northwestel. In all, 39 communities reliant on the Anik F2 satellite for communications services were affected, Northwestel officials said. The Associated Press reported that 1,000 people were left stranded when 48 flights were canceled by the airline First Air due to the satellite malfunction. According to Canada's CBC Radio, residents in affected areas lost long-distance calling, cell phone and ATM services. Some DSL Internet and cable television channel outages were also expected, Northwestel officials said. Launched in 2004, the Anik F2 satellite weighs about 12,118 pounds (5,950 kilograms) and is equipped with 32 Ku-band transponders, 38 Ka-band transponders and 24 C-band transponders. It is designed to provide high-speed Internet and digital communications to users across parts of Canada and the United States. "Anik F2 supports a variety of services in Canada and the United States, all of which are affected by the satellite anomaly," Telesat officials said. The satellite has a design lifetime of about 15 years and its name Anik means "little brother" in the Inuit language, according to the aerospace company Boeing, which built the satellite. 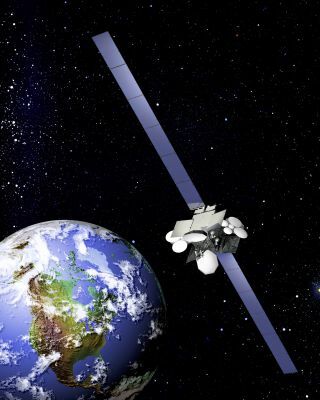 Telesat Canada currently operates a fleet of 12 communications satellites with three more under construction.